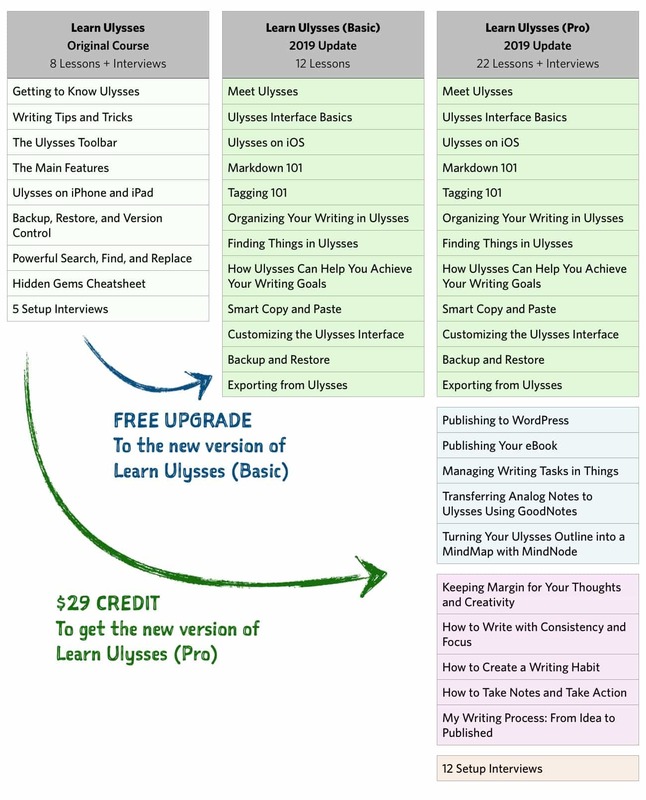 If you purchased Learn Ulysses before March 26, 2019 then you will automatically be upgraded to the latest version of Learn Ulysses (Basic) which consists of 12 tutorial screencasts. The original Learn Ulysses (Pro) course consisted of 8 screencasts and 5 setup interviews. You also get a $29 credit toward the purchase of the new Learn Ulysses (Pro) course. Your redemption code can be found in your Sweet Setup dashboard. To get your $29 credit toward the new Pro version of the course, a redemption coupon code can be found at the bottom of your Sweet Setup dashboard. I can’t access my Learn Ulysses course, what should I do? Send us an email with approximately when you bought Learn Ulysses and what email address you used to purchase it. We’ll do our best to track down your order and make sure you are granted access to the latest version of the course. If you bought Learn Ulysses before March 26, 2019, you are eligible for a $29 credit toward the new version of Learn Ulysses (Pro). The redemption link can be found in your Sweet Setup dashboard. The new version of Learn Ulysses (Pro) is approximately 4x the amount of content originally published in the course. This is truly one of best courses The Sweet Setup has ever made. What happens to the old version of Learn Ulysses? The previous version of Learn Ulysses is out of date and will be retired. Everyone who had access to the original version of the course will be automatically upgraded to the new version of Learn Ulysses (Basic). Which will appear in your Sweet Setup dashboard.